December 30, 2009  The NFL has been slow to acknowledge the long-term effects of concussions from football. That is beginning to change, but will parents stop allowing their sons to play the sport? Only now, at last, are people in the sport beginning to acknowledge the obvious: Football is a gladiator entertainment. December 23, 2009  Like many athletes before him, Indianapolis Colts quarterback Peyton Manning stars in commercials hawking products. But, according to Frank Deford, his deadpan expression makes him better at it than the other guys. 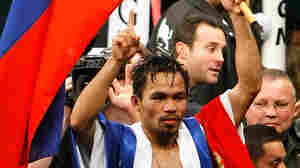 December 16, 2009  The significance of boxer Manny Pacquiao of the Philippines is perhaps unmatched in sports history. Despite his small stature, the fighter called "Pacman" has won seven different world titles. And his influence has been compared to Nelson Mandela's. December 9, 2009  As anyone who's followed Tiger Woods lately knows, times have changed in sports journalism. Not long ago, athletes' off-the-field behavior was also off the record. Now it's prime-time news. December 2, 2009  Notre Dame football has fans all over the country, a network television contract — and an independent streak. Unlike most other major college football teams, the university has remained separate from the big conferences. But it's time for Notre Dame to rethink its independence. November 25, 2009  It may get harder for athletic programs to adhere to the Title IX mandate that athletic representation on campuses mirror student enrollment. Frank Deford notes that if colleges make cheerleading a sport, they might stave off budget cuts to male-dominated sports programs — but at what cost to other female athletes? November 18, 2009  In just one season 100 years ago, 26 players died from injuries sustained in football games. The deaths sparked a national outcry and forced the new collegiate athletic association to take action to make the sport safer. Favre Gets A Bye Week — But Will He Ever Say 'Bye? November 11, 2009  The Minnesota Vikings had a bye week this weekend — and that's a problem for both sports fans and wordsmiths. But a week off is not really a bye — nor is it a reason not to discuss the NFL's age-defying quarterback, Brett Favre. A-Rod's New Success: Enough To Put Demons To Rest? October 28, 2009  When the New York Yankees won the American League title, Alex Rodriguez was embraced by his teammates. The moment marks a turnaround for A-Rod, who has struggled in past post-seasons — and hasn't always had the affection of teammates and fans. October 21, 2009  For some football fans, firing up the grill and sharing a beer are as essential to pregame ritual as the coin toss and "The Star-Spangled Banner." Even late in the season, football fans will tailgate, gathering on the cold, hard tarmac to dine alfresco Americano — even when the weather is cold and very un-picnic-y. October 14, 2009  Boise State has one of the upwardly mobile teams in college football — but there may be a limit to how far the team can go. Commentator Frank Deford says the powers that be in college football keep teams like Boise State from having a shot at the big time. October 7, 2009  Love blossoms for some athletes, while it wilts for others — including Chicago and the brutal rejection of its proposal to host the 2016 Olympics. September 30, 2009  They may not wear a uniform, but baseball announcers like Ernie Harwell become as much a part of the team as the players for some fans, says commentator Frank Deford. Hockey: Why Can't The NHL Just Keep It Canadian? September 23, 2009  Back in the mid-1960s, the National Hockey League was bullish about its prospects in the United States. Today, the expanded league is struggling to pick up Sun Belt fans in far-flung markets in the South and Southwest. TV Flap: Will The NFL Live Up To Its Socialist Ideals? September 16, 2009  The NFL has a long-standing agreement that franchises share equally in television revenues. To commentator Frank Deford, that's socialism — and, he says, the league's TV policies are out of step with the times. At issue: blackouts meant to punish fans who are happy to watch the local team's games from home.